THE IRISH DAILY STAR took a headline from an Irish blogger when describing the outrage sweeping across Ireland following the announcement that two former bank bosses have cost the Irish taxpayer 25 billion euro between them. 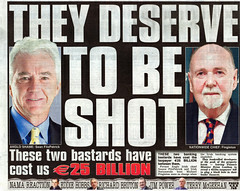 Former Anglo Irish chief Sean Fitzpatrick and Irish Nationwide boss Michael Fingleton were in charge when the Irish banking system imploded. At the height of the Irish property boom, they funded many developers on the back of personal signatures and since those signatures don't translate into real assets, the Irish Finance Minister is shoveling EUR 25bn of tax revenue into these bad banks to plug a gigantic black hole. The sheer amount of money is unfathomable--and well above any order of magnitude the Irish government has earmarked for significant investment in building the country. Instead, every citizen now carries double the amount of national debt than existed a few months ago. When my daughter approaches the end of her college days, I won't be surprised if she moves away to a place where they invest in the future. In my mind, the current whirlwind of financial dealings have little hope of returning a payback for the citizens. Instead, with a higher national debt, Ireland will have to cut back on more services and that means further threats to local hospitals, cuts in social programmes, and reduced spending for essential infrastructure. All of this is happening without a national vote on the leadership. I STARTED USING Gravity around a year ago. Back then, it had a limited but useful set of features for Twitter and it kept me abreast my Twitter conversations without bogging down my overstressed laptop. Things have evolved in that year's time and now Gravity has become a fully integrated social networking client with additional support for Foursquare, Google Reader and Facebook. I can use it one-handed while hanging on street corners. I can let it auto-update while perching my phone in my car's instrument cluster and it shows interesting things like dynamically-refreshing Twitter search results. In my experience, Gravity lets me tag in and out of Facebook faster than with any other client. This sweet little program cost me 10 euro so I bought two of them and run them on different Nokia phones. I'VE BEEN PRIVILEGED to work as a lackey for some very clever storytellers during the past 12 months and they have told me a lot about the history of recording stories in early digital productions. When I was young, every measurement, for even the tiniest of motions, had to be recorded by hand by the camera crew so that information could be replicated later. That's so old hat now and with impatient students wanting to render complicated visual effects on home computers we're often approaching points where the story gets subordinated to an editing suite. Clearly, the tools have evolved at an astonishing rate but if you look behind the credits of a well-received television series, you can see a large group of artists, working as a seamless team, creating imagery that convinces an audience to follow a story. I carry some exciting new tools, like small format HD cameras with quality sensors and file-based recording on board. I can walk into scenes and capture work that goes over the air to a production desk straightaway. But I don't pretend to be the high quailty practitioner. FRONT PAGE HEADLINES, strong editorial opinion, and respected opinion polls all suggest a headless government runs Ireland at the moment. In fact, many Irish citizens believe several current government ministers failed to heed warning signs and blundered Ireland into a deep recession. But it's worse than that--the tactics considered by the current government aren't working and in the minds of more than two-thirds of the population, the government's plodding strategies needs to be put to a public vote now. All the elements of a meltdown now exist in the halls of the Irish government. If I was a betting man, I'd check with Deputy John McGuinness on the timing of the next general election. He has more say in the matter than the fragile leadership at the top. One Year Ago -- "Sunday Qik News from NYC" March 29, 2009. One Month Ago: "Qik Sunday News", February 28, 2010. ONE OF THE WORST PARTS of being one click away from people when using social networking tools is you instantly hear about problems in their lives. So while I busily try to put finishing touches on a document that might help retrain redundant workers, two of my friends lose their jobs. I'm also on a cut list, working in a place that could easily be eliminated by a government cutback but most think that kind of decision is two years away. In the meantime, Of this total, €8.3 billion being pumped into Anglo-Irish Bank next month. Another €10 billion will be required for my bank, AIB. To put things into perspective, the banks are getting €21 billion from the Irish taxpayer while the combined health budget and education budget stands at €23 billion. I have to keep my head down, working to achieve results that pay dividends for those wanting a decent third level qualification. But it's hard to ignore the ferocity of opinion online from a mass of people who now face unemployment, reduced public services and chronic levels of debt. Across Ireland, there are now half a million people out of work. And on Facebook and Twitter, it's not hard to hear about people whose career moves involve immediate emigration. I SUSPECT A half dozen avid users of Foursqaure in Dublin are clever drive-by check-in artists. That's because they often check in while "off the grid" several times an hour. Then they emerge from silent running with more than 200 points for an hour of drive-by Foursquaring. It's just a game but because it's relatively easy to spoof movements, I'm left wondering how many "tips" or special offers are vacuous as well. Not so with Google Latitude. As the screenshot from my phone shows, you can see your friends on Latitude and even get turn-by-turn navigation to where they're positioned. More than any other application onmy creaking Nokia E90, Latitude finds things faster, marks things across its system and onto Ovi maps, and lets me tweet through short status updates. But it sure ain't a swish app store item so many of my friends have never used it. I USED 15 MINUTES to explain how creative multimedia students in Tipperary Institute have developed short video clips to embellish hyperlocal content as rich media pinpoints. There's a screencast at Blip.tv where my Camtasia presentation sits as a testimony to a short text I received during a session at Limerick OpenCoffee folding into a third level assessment. 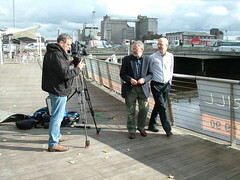 The presentation supported the launch of Inventorium and the end results should benefit tourism in Ireland. LEFT TO THEIR OWN DEVICES, people will use things that might distract others. This happened to me yesterday as I attended an important half-day event concerning a review of a third level degree offering. Developing mobile content features in the proposed new course so I thought it relevant to bring the phone onto the field of play. I also use my phone in its off-line mode as a document reader and annotation device. 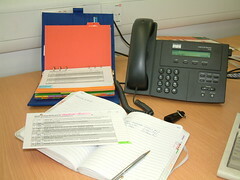 But in the presence of others who had paper and pen, my open (and offline) phone was an unwelcome object. In fact, it earned a few glares, as though people thought I was going to pick up an incoming call. I understood the reaction because I know several people who believe you cannot be with them if your phone is in line of sight of the conversation. As the day went on, I thought about how I should structure a classroom activity around the acceptable use of laptops and mobile devices during meetings. Based on the tabletop reaction today, it's obvious to me that while we're educating people to multi-task, we are also facilitating the development of an unfortunate side effect because it's not unusual to expect meeting facilitators to want fully channelised attention to what's going on around the table, not what's developing outside the meeting room. WE HAVE A TODDLER who is growing up digital. She knows how to slide through interfaces before she knows how to use the toilet. Because I'm not a big fan of glass cockpits, I'm restricting her use of touchscreens but I don't mind her pushing buttons to make things work. That's what she's doing with a digital dictaphone at right. Like a lot of American families, television is an almost constant presence in her daily life. This means she will watch more television before turning three than I did before turning 13. As a very young child, she has been viewing different kinds of screens and trying to manipulate different sorts of electronic media on a daily basis. Mia is growing up with electronic media as a normative part of her daily life. I wonder what's going to happen when she discovers her primary school is locked in the last century. I also wonder what the impact of daily media use is on very young minds. I thought I wouldn't ever let her watch television on her own but she's able to turn on the main TV set, select a DVD, insert it, and push the play button. If it doesn't appeal, she can eject the platter and start again. The only way I can stop her using the set is by pulling the plug. She can switch on the mains power selector by experimenting with the outlets. 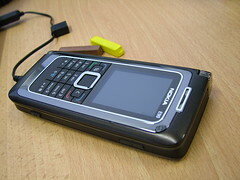 THE RED LINE through the green phone indicates my three year-old Nokia E90 phone is connected to a caller but no road noise is coming through the phone's microphone. I scraped the screen at left while aboard Irish Rail going 82 mph (the phone's GPS gave me that info) and while listening to seven other people in a telephone conference. I had earbuds snapped into the phone and with my mic muted, I wasn't generating any background noise for the rest of the call. One person with an open window to the outside or one phone in a noisy traveling environment can destroy the conversation. So I listened and learned and wondered what I might do for the 22 April 2010 IIA social media event. Being tied down to a tight academic semester means I won't get to the event myself. The teleconference explained details about how the afternoon programme offers an in-depth look at how to maximise the impact of video and audio content for your business. Experts from YouTube, RTE's Online Media Division and RaboDirect will share tips. The event is in the Clarion IFSC and it costs EUR 45 for IIA members. IIA Events -- "Behind the scenes of audio and video content online" is a seminar from 1130-1700 on 22 Apr 10 in the IFSC Clarion Hotel, Dublin, Ireland.